Heat oil in a large pot (I often use my Dutch Oven) over medium heat. When the oil begins to shimmer, add in the curry paste. Cook, stirring a little, until fragrant—about 2 minutes. Add in garlic and ginger and cook for a couple more minutes. Stir in coconut milk, water, and a nice pinch of salt. Scrape any bits that have stuck to the bottom of the pan. Let it come to a gentle simmer. Let cook at a gentle simmer for 3 minutes. Add in zest and juice from the lime. Add Red Bell Pepper, and cook for about 3 minutes, until softened. Add shrimp, fish sauce, and sugar. Cook until shrimp are fully cooked—roughly 5 minutes depending on the size of the shrimp. After 5 minutes, taste and adjust for seasoning, adding salt or lime juice as needed. Meanwhile, bring a large pot of water to a boil. Season with salt. Add ramen and cook according to package directions, stirring infrequently, until the noodles are just short of being tender. Drain noodles and rinse with cold water to stop the cooking process. Add ramen noodles to a pre-warmed bowls, ladle red curry into bowls, garnish with fresh chopped herbs and a few wedges of lime. Serve. •	Red curry paste is your gateway to a delicious, quick weeknight curries, but you need to let it toast and bloom in hot oil in the pan so that you can extract the flavors out of that paste. Red curry paste flavor and heat vary greatly from one brand to another. For this recipe, I use Thai Kitchen, as it seems to be the most commonly available in grocery stores. Others might be more or less spicy, so adjust the amount you are using accordingly. •	Don’t fret about the size of your shrimp—those small shrimp work just fine in this recipe, as do the larger ones. Just remember that the smaller the shrimp, the less time it needs to cook. And if shrimp isn’t your thing, swap it for fish or chicken or pork. •	The duo of ginger and garlic in this recipe works to create a really nice combo of flavor, but if you don’t have ginger in your fridge or any garlic, sub in some onion, or if you’re in a pinch, leave it out entirely. 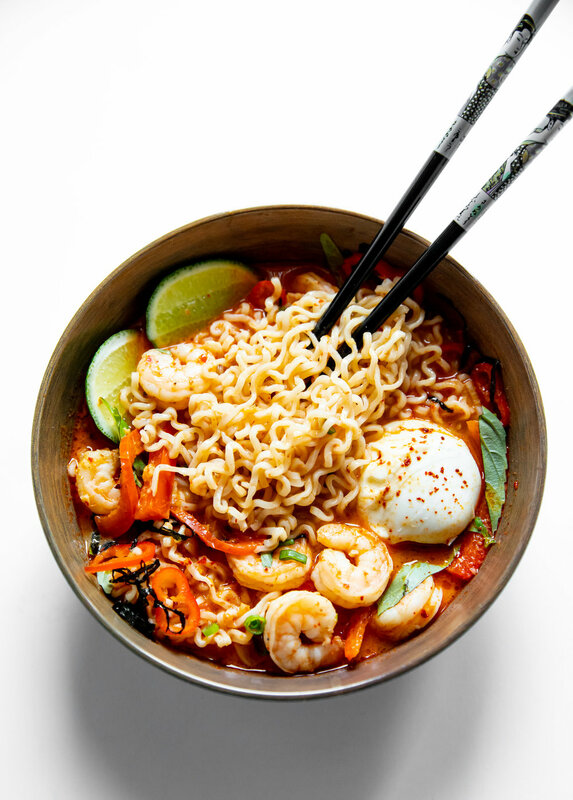 •	If you don't have ramen in your pantry (or if ramen isn't your thing), you can always use rice or another asian noodle in place of the ramen in the recipe. •	Fish sauce gives a lovely umami-packed depth of flavor to this dish. It is the ingredient you most likely might not have handy in your cabinet, but it is worth seeking out (it is available at most grocery stores). And, I promise we will incorporate it into many, many more recipes in this series.